How Do Dogs Get Mites? Foxes may be a source of mites in dogs. Dogs love to run through fields, roll in the grass, dig in the dirt and eat all manner of disgusting morsels. These behaviors expose them to a variety of parasites, both internal and external. Though not as well-known as fleas and ticks, mites are common external parasites of dogs. Almost all dogs have demodectic mites, or Demodex canis. The mites are passed to puppies from their mother while they are nursing, so orphaned puppies who never nursed may not contract the mites. Most of the time, the mites live in parasitic harmony with the dog and do not cause problems. If the dog's immune system is compromised, however, or in times of stress before the immune system is mature, demodectic mites may get out of control. An excess of demodectic mites can lead to demodectic mange, also called red mange or follicular mange. Localized mange, characterized by a few isolated spots of hair loss, typically self-resolves. Generalized mange leads to hair loss over the entire body and may indicate immune problems. Hair loss accompanied by severe itching might be due to Sarcoptes scabiei, sarcoptic mites. These mites live not only on dogs but also on ferrets, cats and foxes. They can also live on humans, though the infection is self-limiting. The mites can live two to six days off a host in warm weather and up to 22 days in cool conditions. 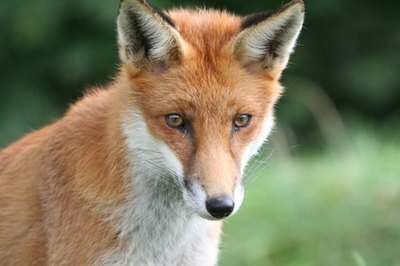 A dog does not even need to have direct contact with an infected dog to contract the mites: He could pick them up by simply running through a field where foxes have been. Sarcoptic mange, also called scabies, is extremely itchy and is often accompanied by sores and secondary skin infections. Cheyletiella mites may cause a dog to develop thick dandruff, especially along the spine. Also known as walking dandruff, Cheyletiella mites can sometimes be seen moving around on a dog underneath the dandruff flakes. The mites are also found on cats and rabbits, and are often called rabbit-fur mites. Dogs contract Cheyletiella mites by direct contact with infected animals or with an infected animal's bedding; the mites can live for several days off their hosts. Ear mite infestations are one of the most common ear problems in dogs. Several species of mites can live in the canine ear canal, the most common being Otodectes cynotis. Ear mites can actually be found anywhere on the body and can be carried by cats, hamsters, gerbils, ferrets, mice and rabbits. These mites are highly contagious and are passed by direct contact. Severe infections can lead to damage to the ear canal and drum, and may cause permanent deafness. What Causes Mange in Cats? What Food to Give Dogs With Pruritus?